Lovely apartment with balcony, just 50m from a long sandy beach, on the first floor of a pretty villa, recently renovated with a very classy and modern look. Perfect also for golf holidays as a 27 hole course lies at walking distance. Just 20 Km from Ravenna’s art treasures, with its world renowned mosaics and 8 UNESCO sites. In the hearty region of the Romagna Riviera, famous for its savoury cuisine, entertainment facilities, hospitality and friendliness of the inhabitants. If you are looking for fun, this is the right place as it is right near the nightlife area and just a 10 minutes drive from renowned Mirabilandia Theme Park. Also great for clubbing and luxury shopping. Many excursions are possible to nearby attractions, art towns and wildlife areas. Water sports, tennis, golf and many other sports are practicable within walking distance. 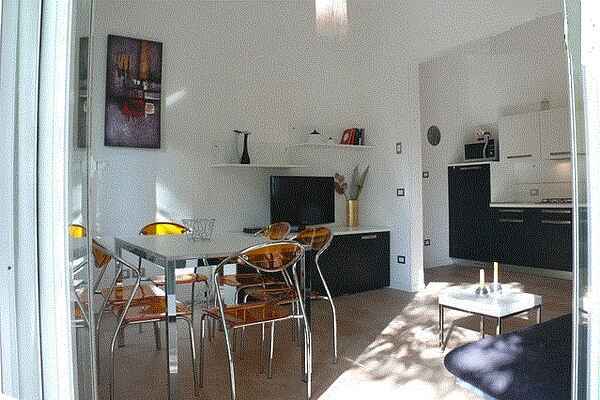 Beach 50m, town centre 100m, many shops, bars, restaurants and facilities nearby. On the first floor of a pretty house with two apartments, it sleeps 5-7 persons and has 2 bedrooms, 1 bathroom, kitchen, living/dining room with double sofabed, SAT LCD 32” TV + LCD TV 19”, washing machine, dishwasher, air conditioning, heating, car park, furnished balcony, independent entrance with small yard. Beach 50m, town centre 100m, many shops, restaurants, sports facilities and services nearby.